This is definitely not for everyone... I'm neutral on the idea of it all (feel free to ask me in person why lol). It does give me a chuckle though! However, I will not be turning Gibby into an Armadillo anytime soon, hahaha! What follows is copy and pasted, click photos to enlarge. 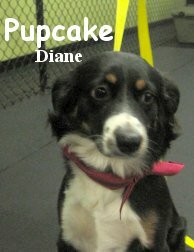 Meet Pupcake, what an awesome name! She is a nine month old, about thirty pound, Tri-Color, Australian Shepherd. Pupcake came into Fort Fido full of high-energy, ready to get to it. We started her in the Medium Roll where she stayed and prospered. Pupcake got along well with the other pack members, she played quite a bit and seemingly enjoyed her stay. Welcome Pupcakes ;), you can comeback anytime and we hope you will. From the Big Roll we have a clip of new pals Copper and Zodiac, it's great to see these two get some energy out. Don't mind Ryker relieving himself haha, when ya gotta go, ya gotta go. Two from the Medium Roll. One showing the love affair that is "Barkley & Kona". The other clip is to show that new pup Bogie is doing just fine in the Medium Roll lol... Here he takes down a boxer! 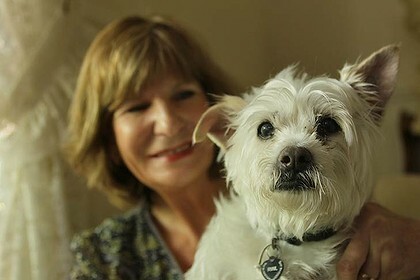 A few days ago, I found this neat link to a story about a Jack Russel Terrier named Lily who loves to chase bicycles. It's just amazing how well she can keep up with her owner. I know that my pup would give up after a minute or two--he definitely wouldn't keep pace for over a mile! Dogs with dementia are being considered as possible candidates for medical trials that will help to find cures to Alzheimer's in humans. Golly is an 11-year-old English Setter who hasn't let a major disability hold him back from his passion for hunting. Though you wouldn't know it, Golly is almost completely blind. This story is incredibly sad, but also a great example of why we remove all coats, collars, harnesses, et cetera that dogs are wearing when they attend daycare at the Fort. A pup died while being boarded when her collar and tags got wedged in a fence. My heart goes out to her family. If there is room for another furry friend in your life, Kindred Souls Foundation has recently rescued more than 50 dogs from a hoarding situation, and they are looking for good homes for these pups. I hope that you all enjoyed the holiday! 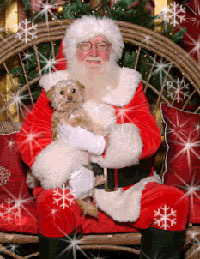 P.S.--Check out the schedule for Santa photos at the Tacoma Mall- there are reserved times for pet photos, if you are interested in a cute and furry holiday picture for your cards this year! Say hello to Sam! 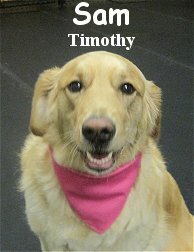 She is a four year old, eighty pound, Golden Retriever that had her assessment this morning. Like a typical Fort Fido Golden, Sam had a blast here. We started her off in our Big Dog Roll and that proved to be the perfect fit for Sam's play-style and temperament. She communicated with the other pack members graciously and had a good hardy run of play. Sam is welcome back to The Fort anytime, we look forward to seeing her regularly. A special thank you goes out to all of our amazing customers. We are truly thankful for your business and gallant support! P.S. I'll leave you with some clips from today, one features Sam. Don't forget, we will be closed tomorrow and Friday. See you Saturday! Wow! You gotta check this one out if you haven't already. My wife pointed this video out to me a couple days ago. Sad yet absolutely amazing at the same time. And a clip of each Roll. Hi there, hope your Monday is going good. Here are a few links and clips from today for ya. The Medium Roll had the trio of friends Gracie , Sadie & Sofee mixing it up all day today. From the Little Roll we find Mr. Pee-Wee acquiring a "girly friend" in Pearl. Good luck Pee-Wee, Pearl's a whole lot of woman hahaha. What can be done about family's aggressive little dog? P.S. Please remember, we will be closed this Thursday & Friday (Nov. 24th & 25th). We will be open and ready for action this Saturday (Nov. 26th). Here are a couple of glimpses at the action from the Fort today. This first clip features a whole lot of the dogs that were here today, tearing it up! You can see Lila and Blue, Gordon, Buddah, Tikvah, and Emily all getting in on the action! In this next clip, Gordon and Lukas have a good romp, and you can see Tikvah and Buddah having some fun of their own in the background. 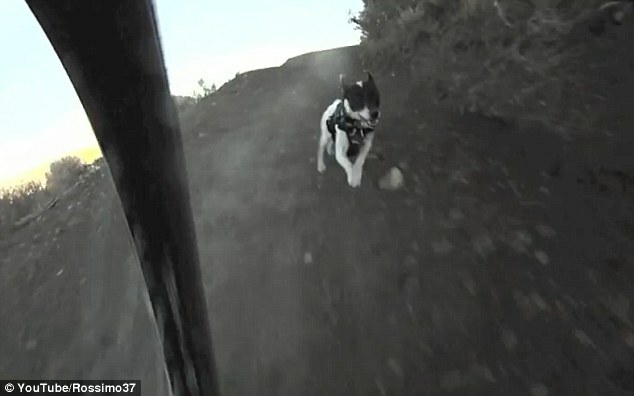 In the news, I found a clip about a dog that led police on a mile-long chase down the freeway after leaping from a car involved in an accident. Thankfully, pooch is just fine and has been reunited with its owner. A friend of mine from band emailed me this funny dog photo set, enjoy! Several of these pics gave us quite a chuckle. Have a nice weekend, watch out for the white stuff! It's a bit hard to see in this pic but Rufus the Doodle got an extraordinarily awesome new hairdo lol! He asked for and received the "Lion Cut", although in this pic he looks more like a Camel because his Buddie's head blends in behind him looking like a hump haha. Here is a clip of the lion-heart in action, of course, Marco Polo, has to make sure he is still "King of the Jungle". ;) He, among others, really enjoys Rufus's company due to his outstanding temperament. Get a load of Bogie! 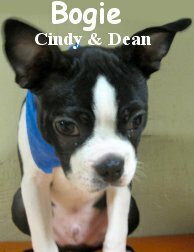 He is a darling, spunky, three month old, fourteen pound, Boston Terrier that had his assessment at Fort Fido this morning. This pup was something else... Bogie came in looking all sweet and innocent but his true colors shined in a short amount of time haha. He tore it up (played hard) instantly with the best that the Little Roll had to offer. We are certain that Bogie will be heading down to the Medium Roll rather soon, it's a good thing, he's ready for the next level of play! Hopefully Bogie will get a chance to meet Mama Beija before he goes Medium. He had a boisterously fun time here and we look forward to seeing him again soon. P.S. Here is just a taste of the Little Bogster in action... I'm sure there will be some better clips of this guy in time, he's an animal. Also, he was tricky to get a picture of, you could imagine why, he was surging with life and ready to roam. There's never time for a photo-op lol. Please welcome Samantha. 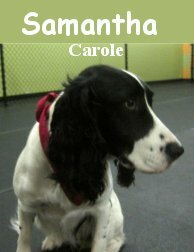 She is a lovely, one year old, forty-six pound, Black and White, English Springer Spaniel. Samantha joined our Medium Roll and was a bit hesitant at first... Unsurprisingly, she busted out hard after a few hours. Samantha just couldn't resist Grady's Chocolate Lab Charm Haha! Samantha did really well for her first day at The Fort. We look forward to her attending. Thanks to Grady for helping bring Sam out of her shell, way to be bud! P.S. Here are two clips of Miss Samantha having a barrel of fun in the Medium Roll this morning. We finally have some new Dog Training Class and Seminar dates up on our website. They will be after the holidays, it's a lot easier for everyone in class that way. 11:00 am - 12:30 pm $50 All dogs welcome. Dog Whispering VS. Dog Training! Don't be shy, bring your crazy, hyper or wild dog and Garrett will do live demos! Tuesdays & Thursdays 7:15 pm - 8:15 pm (six one hour classes) $140 All dogs welcome. Late Friday evening I found a wonderful Galley of photos on King5's website. It is the Dogs of War Gallery. Check it out here. Curl up with the news! 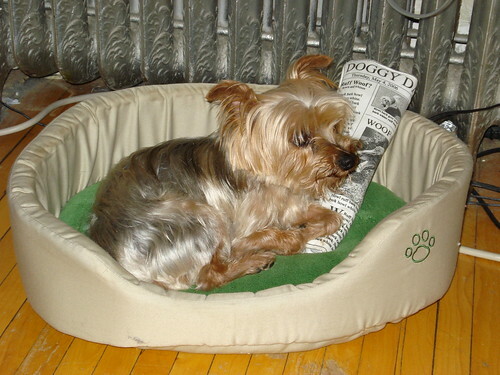 I rustled up a few interesting doggie articles in the news today. First up is the story of a thousand-dollar dog lunch. Literally! A family dog ate $1000 in cash that was left in an envelope on the counter. Now that is an expensive meal. A four-legged veteran is getting stem-cell treatment to help her arthritis and to improve the quality of her life. A newly-adopted Saint Bernard defended his new family from a burglar, chasing him from the basement. This was only seven hours after having been adopted! Therapy dogs visit students with autism, and provide a unique experience for these children. A pup that was dragged behind a pickup now has a new home, where she can recover and be safe. In case you didn't know, this is National Pet Adoption Weekend. Today and tomorrow from 9-6 at all Petco locations, there will be adoptable dogs and cats as well as more "nontraditional" pets--rabbits, guinea pigs, and others. The Humane Society is teaming up as well, bringing some of their adoptable cats and rabbits. This one isn't dog-related, but it's still pretty shocking to see that there was a black bear wandering Lakewood! P.S.--The Seattle Times has a great list of pet events available on their website, check them out and see if there's anything you're interested in! This morning we met a sweet little Basset Hound named Mollie, and welcomed her into the pack. 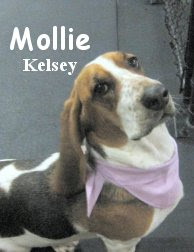 Mollie is 15 months old, and made a really great addition to the medium role. She has been well-socialized since a young age, and it really shows in her interactions here. She speaks great dog, and had a good time tearing it up with the other medium pups. We even got a great clip of her playing with her new friends Tikvah, Chewy, and Kona. Everyone enjoy the long weekend! Cute Clip, News, and a fun project!